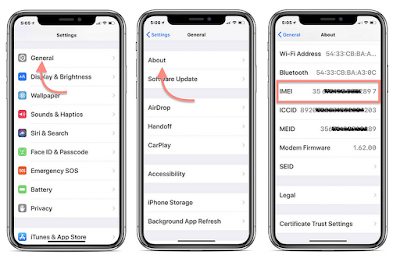 How to Find iPhone serial number, IMEI, ICCID, or MEID - Here our iPhone tips and tricks to view iPhone serial number, IMEI, ICCID, or MEID on iPhone XS, XS Max, XR, X plus iPhone 11, 10, 9, 8, 7, 6, 5 or iPhone SE. Turn on your iPhone (iPhone XS, XS Max, XR, X plus iPhone 11, 10, 9, 8, 7, 6, 5 or iPhone SE 2), go to the Settings > General > About. To find the serial number or IMEI on your iPhone, iPad, or iPod touch get here. Locate your iPhone. Click the Summary tab to see its information. 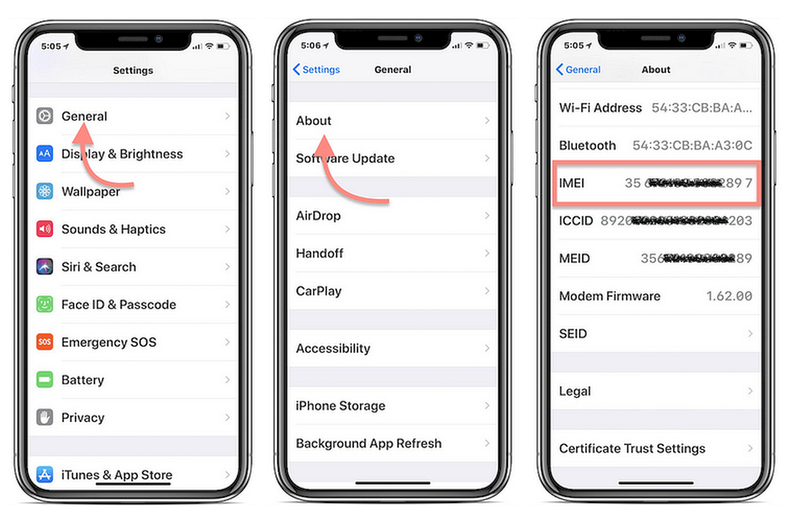 For an iPhone, click Phone Number to find the iPhone XS IMEI/MEID and ICCID. If you still have your iPhone box, you can see the serial number and IMEI/MEID on the barcode read carefully each number. 1. Go to your Apple ID account page (appleid.apple.com) in a web browser on your computer. 2. Sign in with the Apple ID that you use on iPhone or another device that you need the serial or IMEI/MEID of. 3. Scroll down to the section called Devices. You can see iPhone serial and IMEI/MEID number on selected device. If you got latest problems on your iPhone, see iPhone problems or you can go to the iPhone Support website to know more. On iPhone, go to Settings > General > Regulatory.